We had two supporters, Rachel Nolan and James Davies, taking part in the London Marathon in support of the Trust this year. We are blown away by both their finishing times and their fundraising and we cannot thank and congratulate them enough. 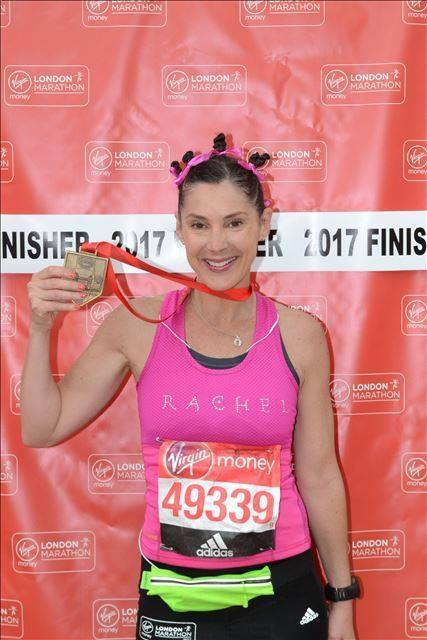 Rachel, who ran in memory of her friend’s son, Tom, told us, “In 2016 I saw a friend running in the London Marathon; the amazing atmosphere and all the emotions it evoked made me desperate to have a go – I have always dreamed about being able to complete a challenge like a marathon. I wanted to raise money for Myotubular Trust and I realised I may be able to make a difference. The challenge which lay ahead, once I secured a place, was a big one but I prepared and trained by the book. To read Rachel’s Story of Preparing for and Running your First Marathon, click here. The day itself was wonderful. I was apprehensive but had great support from family and friends and the atmosphere in the crowds was electric… live music and singing in many places and it seemed like everyone was shouting our names as we passed by. Up until the day the longest I had run was 21.3 miles, therefore I knew that the last four or five miles were going to be tough. However the incredible atmosphere made anything possible! I was lucky enough to only start feeling the pain at 24 miles. I think this ability to cope came from my marathon preparation. 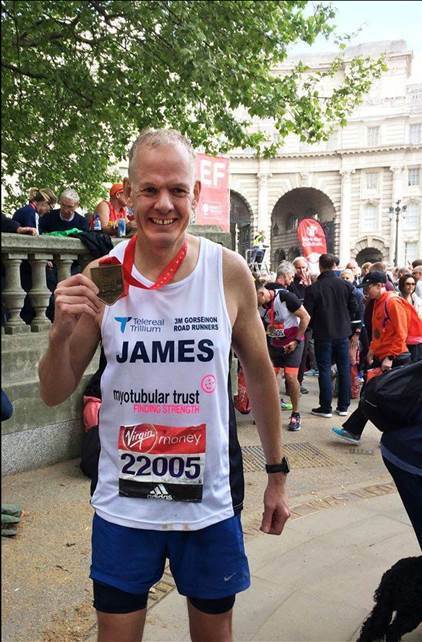 James, who was inspired to run by his neighbour’s son, Sean, who has centronuclear myopathy, told us, “I loved the day and was so pleased to go under 4 hours. It was an honour running for you and it was great to see Sean a few days before the event, who also thanked me for raising money for Myotubular Trust. The support on the day was phenomenal and I felt like I was smiling all the way. My legs are aching and I have a couple of blisters on the feet but all for a great cause”. Rachel and James, you are superstars and we hope that you are now fully recovered and enjoying life without training….